New Ghostbusters toys are coming, but where are the guys? Director Paul Feig recently tweeted a photo of action figure prototypes from the new Ghostbusters film, due in theaters this summer. While the latest toys look great, and appear to contain more points of articulation than their ’80s Kenner counterparts, there is something that appears to be missing. We are currently living in a world where even men’s rights activists have accepted the reality of a female-led Ghostbusters reboot. (A statement from Return Of Kings is expected any day now.) So where are the 6” plastic replicas of Dan Aykroyd, Ernie Hudson, and Bill Murray, all of whom have been confirmed to be appearing in the film? Also, where is Chris Hemsworth’s secretary character? Sure, the Kenner line didn’t release a Janine Melnitz action figure until the fourth wave in 1988. But please, Mattel, let’s learn from our mistakes. While it isn’t confirmed by any research or science, I believe that it’s genetically impossible for boys to buy girls’ toys. So how are grown men supposed to get in on the action of carefully placing unopened packaging on their display shelves, far out of the reach of children, if no male figures are represented? Yes, there is currently a movement to remove gender stereotypes from children’s toys entirely, but that’s still a long time coming. In the meantime, Hasbro has done its part for mens’ rights by changing female dinosaurs to male in its Jurassic World line. It also added Rey to its Star Wars Monopoly game, and if Rey, a girl, can be added to a Star Wars game, which is obviously for boys, simply because she’s the main character in the movie, surely boys can be added to this all-female Ghostbusters squad. What is good for the goose is just as good for the gander. Let’s be clear, this isn’t about men, or even women. This is about our sacred childhoods. 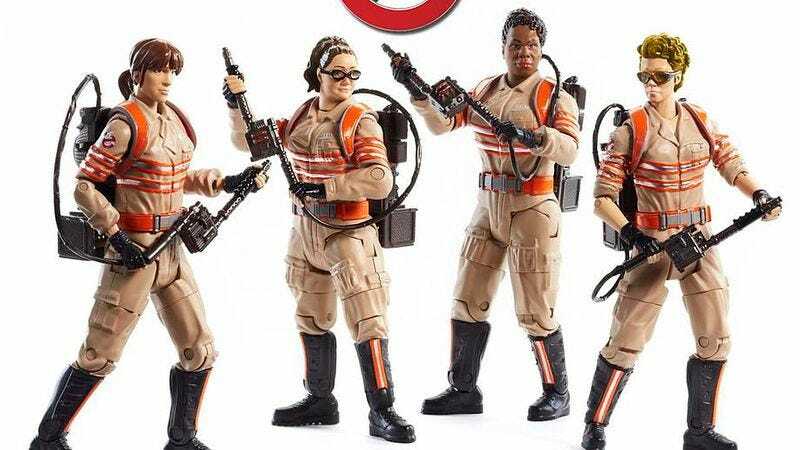 Men need action figures too, and not releasing male-targeted toys in the first wave of Ghostbusters action figures is a slippery slope. It will only be a matter of time before there is no boys’ aisle at the local Toys “R” Us, and most of us wouldn’t know what to do with a girl(’s action figure). So Mattel, take a cue from Hasbro and bring the boys back to the Ghostbusters toy line. I encourage my fellow men (and any women sympathetic to the cause) to ask the the question: #WheresRayStantz?